Specializing in doctoral gowns and academic graduation regalia. You've worked hard earning your degree. Obtaining your college regalia shouldn't be a struggle. 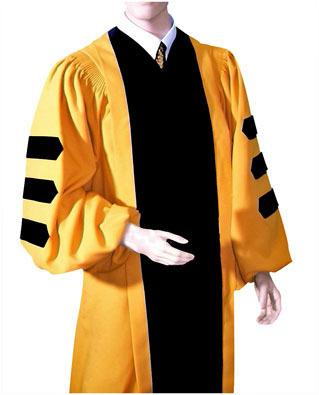 University Caps and Gowns .com graduation robes and accessories makes ordering your academic graduation regalia e a s y with outstanding customer service, and IN STOCK caps and gowns and academic hoods. We keep a full range of in-stock college cap and gowns, as well as cap and gown sets for high school, middle school and preschool for immediate delivery. Our college cap and gown department handles bachelors, masters and doctoral / PhD regalia including the academic gown, academic hood, and doctoral tam with tassel. 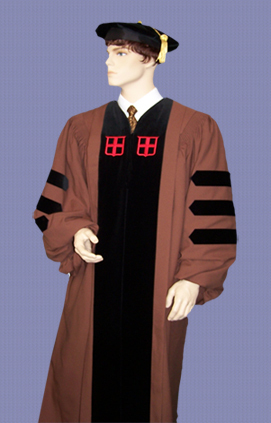 University Caps and Gowns offers both traditional academic regalia and specialized custom made doctoral regalia. 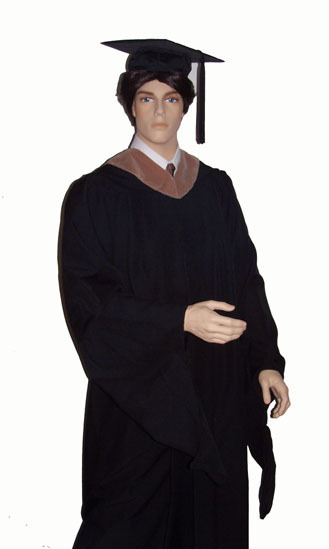 We also carry a full line of academic caps and tassels, including mortarboards and doctoral tams; and graduation hoods (doctoral hood, master's hood, etc.). Faculty members: Miss the ordering date in your local bookstore, but still want a quality doctoral gown? 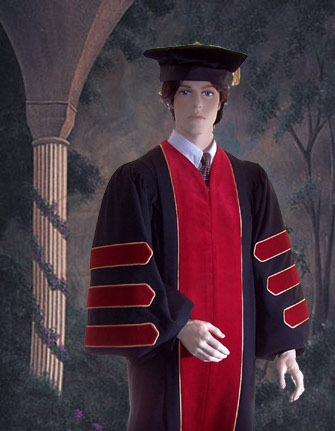 We keep deluxe PhD and doctoral gowns IN STOCK, as well as velvet tams and graduation hoods, and we even accept late orders. Ask us about our free loaner program! Our cap and gown department is reachable by phone, fax and e-mail for all your graduation regalia requirements. 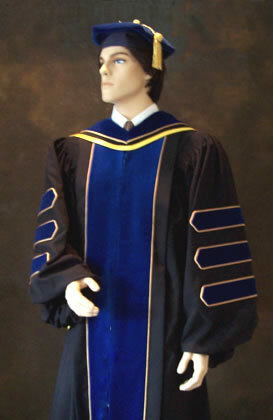 Academic Hoods: Doctoral Gown with black velvet and light blue piping, shown with Ed.D. academic graduation hood with light blue velvet. Having trouble finding the correct colors for your academic hood? We have thousands of schools in our data base. Call or e-mail us and we'll provide you with the correct colors for your academic hood. We would also be happy to fax or e-mail you a diagram on how to properly wear your graduation hood. Just let us know what you need. Key Chain Tassels and other graduation gifts. Doctoral tams with bullion tassels. 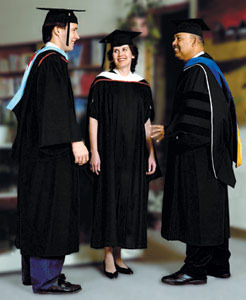 College Caps and Gowns: bachelors, masters and doctoral level academic attire. 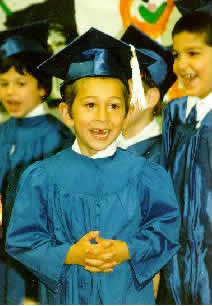 Master's Cap and Gown, with academic hood.